Once I went over a small falls in my stripper kayak. At the bottom was broken concrete with rebar in it. I clenched my teeth as the little kayak ground over it—hoping I’d built it tough enough. Fortunately, when I pulled to the bank to inspect the damage, there were only superficial scrapes. Glass fabric is used in strip composite construction to supply cross grain strength to wood planking. In traditional building methods, closely space ribs serve this function. While one layer of cloth on each side of 1/4″ planking is appropriate for a canoe, it’s inadequate for larger hulls. Three good ways to increase strength and stiffness are, increase plank thickness, add more layers of reinforcing fibers, or use stiffer (higher modulus) reinforcing fibers. To measure the effects of these variables, we subjected strip planked 12″ x 12″ test panels to high loads over a short time until the panels broke. We constructed 16 western red cedar/glass samples, using WEST SYSTEM® epoxy to bond the fiberglass fabric to the strip planked panels, using normal wet lay-up procedures. We let the epoxy cure thoroughly at about 60° F. We also built seven panels using marine grade plywood for comparison. We tested four thicknesses of cedar (3/16″, 1/4″, 5/16″ and 3/8″) with both one and two layers of two weights of woven glass fabric (4 oz. and 6 oz.). We accurately weighed the samples. Next, we applied a three-point bending load on each panel with our MTS machine. The machine exerted loads parallel to the grain on the cedar samples, and parallel to the face grain on the plywood panels. We measured and recorded the loads exerted in pounds, and inches of deflection at specific points until panel failure. The ramp (rate of pressure applied) was selected for relatively short duration. 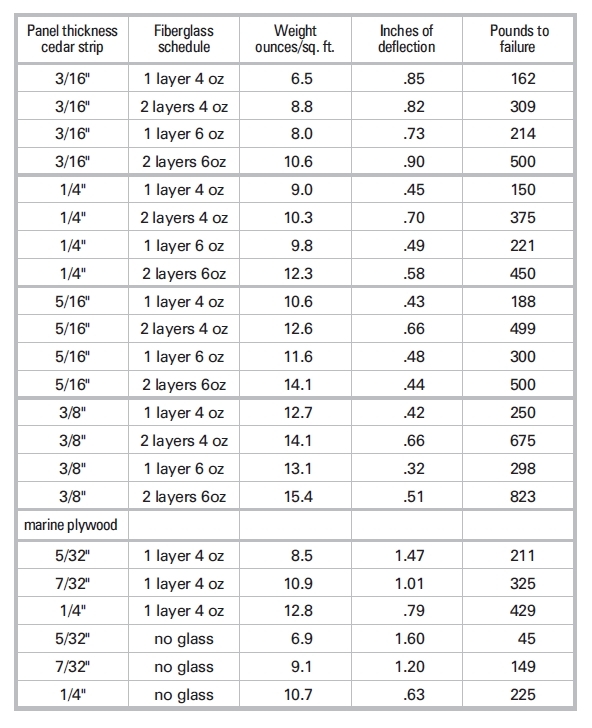 The chart shows stiffness as “inches of deflection” at failure and strength as “pounds to failure.” Marine plywood of standard sizes used in small boat construction (with and without fiberglass cloth) is listed on the bottom of the chart as the known quantity for comparison. As expected, the panels became heavier as we added fiberglass cloth and epoxy. However, surprisingly little weight was gained relative to the increase in strength and stiffness. Data indicates that increasing both the number of layers of cloth and the thickness of the wood core will increase the overall strength of the wood strip structure without adding much weight. We found that 1/4″ cedar between layers of 6 oz. glass cloth, the proven schedule for canoes, failed when subjected to a load of 221 pounds. An additional layer of 6 oz. fiberglass, as might be applied to a canoe’s bottom, increased the failure point by over 100% (to 450 pounds), but added just 25% more weight (2.5 oz./square foot). The numbers don’t adequately convey just how much energy it takes to cause failure. You’d have to be in the laboratory when it happens to fully appreciate it. The MTS test machine applies force silently and nearly invisibly (up to 100,000 pounds). At the moment of failure, there is a sound like a rifle shot, then a puff of cedar dust and pulverized glass. Examining this data, we may develop practical ways to use wood strip construction. We hope it benefits those who are considering using this nice building method.